Former Vice President Dennis Black speaks in front of faculty and students. Black and former Director of Campus Living Andrea Costantino will appear before State Supreme Court Justice John L. Michalski Thursday morning and are expected to plead guilty to felony charges of stealing hundreds of thousands of dollars from a UB bank account. 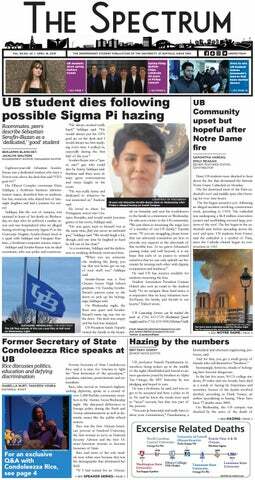 Former UB Vice President Dennis Black and former Director of Campus Living Andrea Costantino are scheduled to appear before State Supreme Court Justice John L. Michalski at 9:30 a.m. on Thursday in Buffalo and are expected to plead guilty to felony charges of stealing hundreds of thousands of dollars from a UB bank account, The Spectrum has learned. Black, who worked for UB for 38 years and was a widely-known and recognized figure on campus and in the community, resigned suddenly in July 2016 amid allegations of inappropriate spending. In October, The Buffalo News reported that Black was at the center of an investigation by the State Inspector General’s Office and the Erie County District Attorney’s Office into whether the expenditures – reportedly worth between $250,000 and $600,000 – were proper. Black held numerous UB positions before being appointed vice president of University Life and Services in 2010. In 2015, he drew a salary of $287,385. Black was also a prominent community member, spearheading several campaigns for the United Way of Buffalo & Erie County and serving as the vice chairman of the Buffalo Philharmonic Orchestra’s Board of Trustees. He reportedly relocated to South Carolina, where he had a second home, shortly after leaving his position at UB. “The university has no further comment at this time,” the statement read. Vice President of Student Life Scott Weber, who replaced Black in January 2017, declined to comment on Wednesday. Costantino resigned her Campus Living position abruptly on Aug. 18 after more than 20 years of service. She departed four days into a staff training session. She was not available for comment on Wednesday. Both Costantino and Black are UB alumni. Black also earned a law degree at UB. Following Costantino’s resignation, Weber praised her in an email. Attempts to reach Elizabeth Lidano, interim director of Campus Living, who replaced Costantino on Aug. 18, were unsuccessful on Wednesday. A press conference with the Erie County District Attorney’s Office and State Inspector General’s Office will follow the court appearance Thursday morning. The Spectrum will be reporting live from the courthouse. Spectrum reporters Max Kalnitz and Emma Medina contributed. Hannah Stein is the editor in chief and can be reached at hannah.stein@ubspectrum.com.